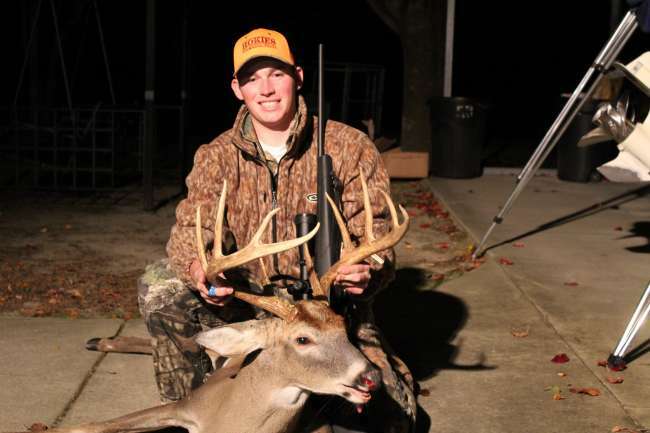 Virginia Tech Forestry student from Creedmoor, NC, home for Thanksgiving break, bagged this 134” 10-point buck Sunday afternoon while hunting in Granville County. This buck showed up on camera twice this week during the early morning hours, coming in both times while two young bucks were seen fighting. A combination of rattling and a series of grunts woke him up from his Sunday afternoon nap and he came to investigate. The hunter harvested the buck with a single shot from a Weatherby 300 WinMag, loaded with Barnes Vortex 180-grain ammo..